R300 per month for group nursery school lessons mornings only. Nursery school classes. Our unique Swim SA based program ensures all ages learn to swim in a fun, non threatening environment for babies from 8 weeks to adults. We are a mom and daughter team whom solely instruct from our enclosed, heated, home based pool. 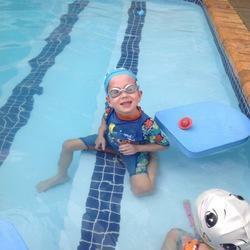 Our pool temperature remains constant at 33 degrees so winter swimming lessons and baby lessons are comfortable. We also offer stroke correction and adult lessons and make use of "water treadmills" for those that require more length than our 10m pool accommodates. Moms and dads are welcome to join us in the water too and we encourage parents to view all lessons. We offer a free trial lesson for all new swimmers. We have small classes with 2 to 3 in a group of 30 minute lessons. 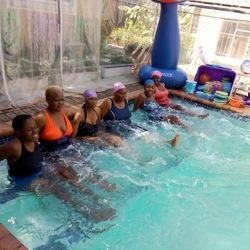 We also offer free domestic worker swim and rescue lessons to those helpers whom care for our enrolled swimmers. We are also very lenient with catch up lessons. Experience is evident!